Hi guys! Hope everyone (my fellow Americans) had a great Independence Day. Darren and I took advantage of the long weekend and spent it at The Cape with our friends, Jean & Nick. Although Darren & I originally made plans to visit Florida, Cape Cod won when we were weighing the pros & cons of flying versus driving during the holiday weekend. Our plans were so last minute, we didn't book our room until the day before! 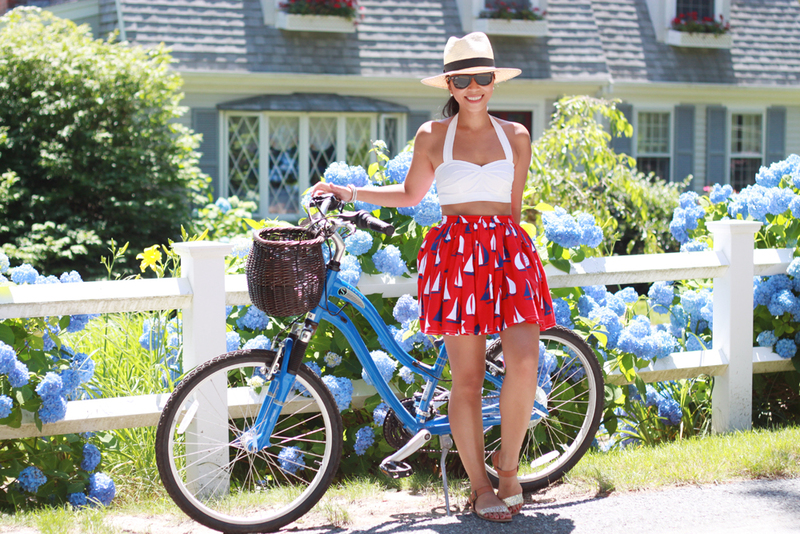 With the beach as our only agenda, we did very little research on the area which resulted in inappropriate biking attire when we discovered the Cape Cod Trail Rail! But wearing a skirt is not as impractical as one would think. With the right undergarment, it is quite comfortable. If Olivia Palermo can bike in skirts, dresses and heels we sure can too, right? I mean, it makes for such cute photos! You ladies look darling as always! You both look lovely! Any info on the bikes? Thanks K! It was a rental from http://www.barbsbikeshop.com/. Lovely pictures! You girls look like a spread magazine. Adore the voluminous skirt, perfect for the summer. Cape Code sounds and looks like an amazing place! Love these photos!! You both look so gosh darn cute! 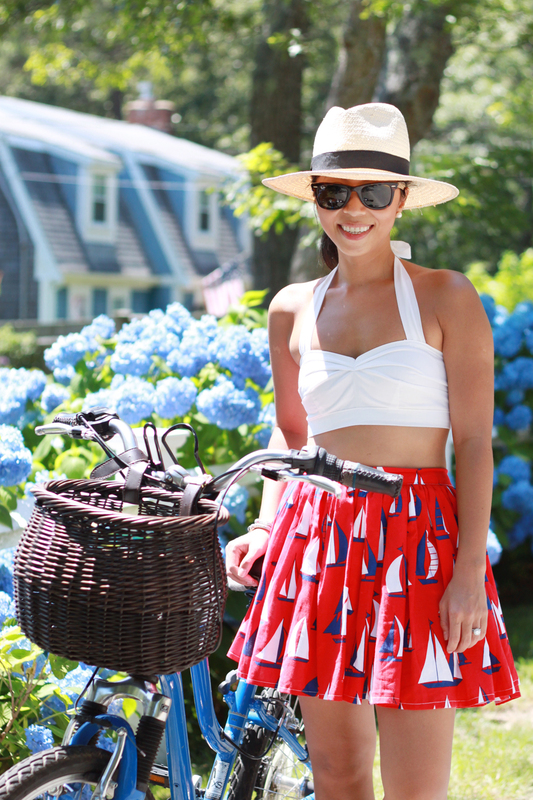 I've been biking in a crop top and matching high-waisted skirt all summer. It's really quite practical! Bonus points for the sailboat print Too cute. I tried to make a similar skirt.. what type of fabric did you use? Ohhh, so LOVELY photos!! <3 I love the scenery, so pretty. Super cute, looks like pictures you would find in the ads of Anthropologie, ModCloth, or Urban Outfitters! Visiting Cape Cod is on my list for the Summer, do you have any good recommendations/suggestions for what to do there? both of you look darlings...... super cute. Your pictures look like a part of a rom-com movie! This looks like a pic from a magazine! You two are so cute...you make me have petite-envy! Such cute outfits, you are so talented!! Seriously. Best photo shoot and outfits EVER. It's so lovely to see you both together in a photo. What a lovely little photo shoot! You two look so darling.. I love the old-fashion bikes with the wicker basket!